Seele views itself as an improvement on Bitcoin, Ethereum’s smart contract, and Lightning Network. Seele’s technology is based on a neural consensus protocol, an algorithm which provides the scalability and performance and speed increase that is needed as the numbers of nodes increase. The goal of Seele is to develop a new era of Value Internet Connection protocol that can better meet the requirements of the blockchain network than tradition protocols current used. It can be helpful to think of Seele as a super-distributed cloud computer with millions of transactions per second (TPS) as well as the ability to store these transactions. The name of the company means “soul” in German. The term refers not only to the human soul itself but also to the core of a person’s ideas or actions. The implication is a complete and total transformation and ushering in of a new era of Quick Value Internet Connection (QVIC). The CEO of Seele is Dr. Bi Wei, who has introduced Seel’s technoloogy as blockchain 4.0. The project was a cooperative partnerhsip with UCL CBT (University Collect London Centre of Blockchain Technology), in addition to researchers, scientists and engineers from the US and Asia. Wei has patented eight blockchain-related technologies. A former London University postdoctorate, he has a Masters in Computer Science at Oxford and is currently the Deputy Security General of the China Blockchain Technology Innovation and Application Alliance. The team is composed of workers from both the UK and China. Several of the members of the team have worked at Microsoft. • Bottlenecks in performance. Bitcoin is limited, with 7 transactions per second (TPS). Applications must wait for several blocks (usually six). As Ethereum takes 10-20 seconds to create a new block, these delays hurt the growth of blockchain services. • Intra-chain business interferes with one another. Certain businesses, such as very popular mobile games, can crowd the entire Ethereum network, making it difficult to process transactions. • Closed-network structure. If cross-chain interaction does not occur, businesses cannot interact between multiple platforms. The solution to this was a multiple blockchain structure. This is only a partial solution, however, as the multiple parallel chains are not able to meet rapidly changing and diversified business needs. In addition, the challenge of sharing of computing and data resources on multiple chains has not been fully solved. Any side chains are based on the main chain, and dependence on the main chain is problematic in the event of a bottleneck. A better solution is a Heterogenous Forest Network (HFN). In an HFN, each chain provides the minimal number of services needs, so that each service can run in separate chains. This allows the real world to parallel the digital world while at the same time ensuring security and optimization. It also provides cross-chain access that allows transaction between various chains. • A neural consensus algorithm that sorts large scale nodes. Nodes are the network bitcoin uses to broadcast messages. They must be able to provide transactions while remaining secure. By using randomly selected nodes to carry out transactions each time, the network reduces the possibility of double spending (that’s when a user tried to spend the same digital token twice). The basic rule is that the more nodes in a network, the greater the security. • Value Transport Protocol (VTP) and Value HTTP. These allow for the naming, discovery and addressing of Value Internet assets and entities. These then integrate with the internet resources to build underlying protocols and infrastructure services for the blockchain ecosystem. 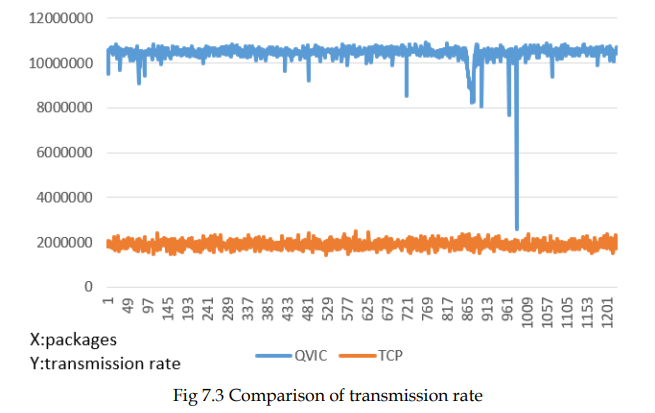 • Proposed TCP/UDP-based low latency Quick Value Internet Connection (QVIC) protocol. This protocol can better meet the requirements of the blockchain network than traditional TCP and UDP protocols because they are able to handle more connections as well as provide better security and lower latency. In addition, transmission efficiency is improved by nearly 1 order of magnitude, meaning it is improved exponentially. Tokens will fulfill two functions: to reward nodes or be used to charge transaction fees. The current plan is to give more privileges to token owners and less to miners. This will be done by giving users tokens for improving the network speed and connectivity. 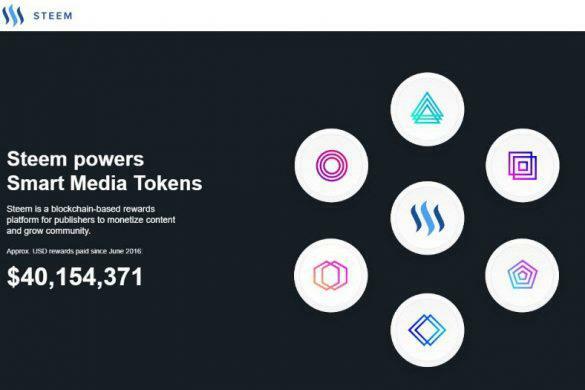 However, the details of the token distribution remain vague since it is all part of the roadmap for 2018. 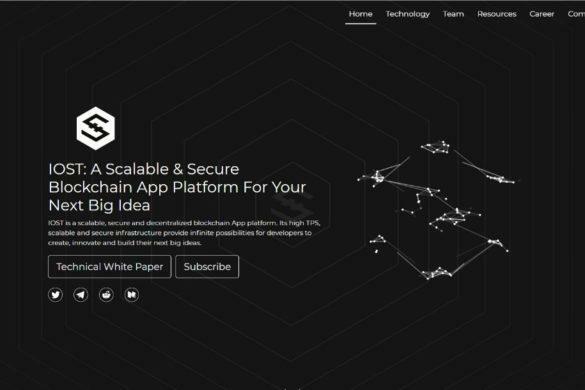 The goal of Seele is to build a powerful platform and high-speed infrastructure for the free and safe circulation of resources, positioning, discovery and transfer of value globally. It is built on an open-source platform. To meet this goal, Seele has developed a neural consensus algorithm to improve fault tolerance from 33% to 40% without any loss of performance. • The basics of Blockchain 3.0: Faster consensus and transaction confirmation, high concurrency, cross-chain, and better governance mechanisms, etc. 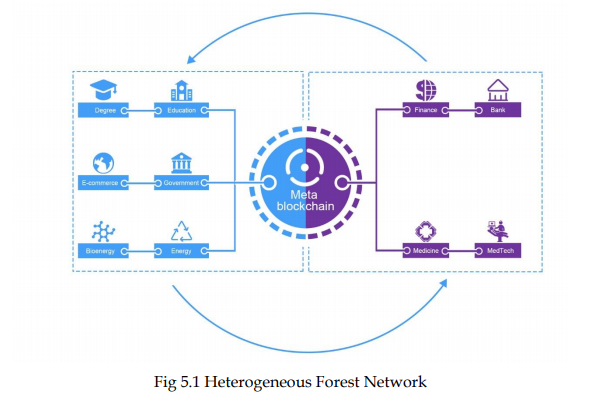 • Value Internet, heterogeneous forest network (HFN), and a neural consensus algorithm which functions faster according to the amount of participation. 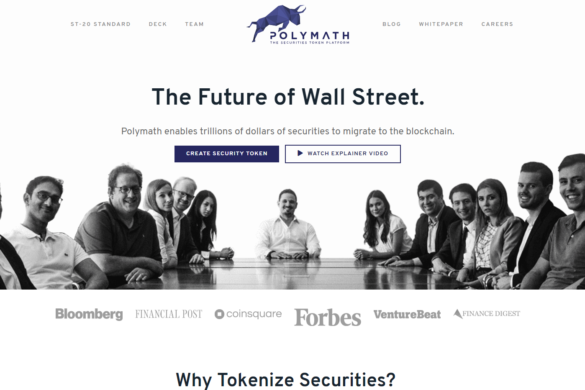 • An innovation governance mechanism that takes into account efficiency and fairness, the co-existence of various consensus algorithms, and various token systems and decentralized exchange rate mechanisms. • An ecosystem of technologies that encourage greater trust and information exchange, as well as better business collaboration in the aim of building a more efficient society. Seele has gained negative attention in the press after two of its employees were caught soliciting payments from recent members of the Telegram group. 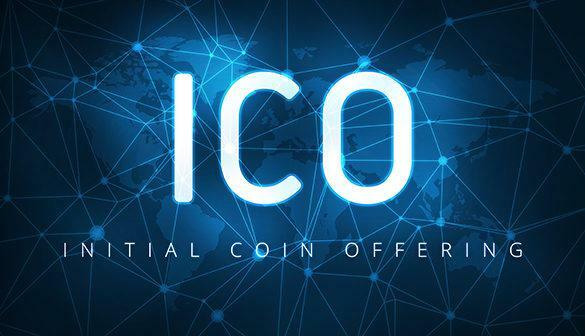 This scam occurred when the fraudster offered members of the Telegram group a private sale of tokens before the ICO, convincing participants to send their funds to a false wallet. The fraudster was successful and received 2,161.49 ether, an amount equal to $1.8 million at the time of the transaction. 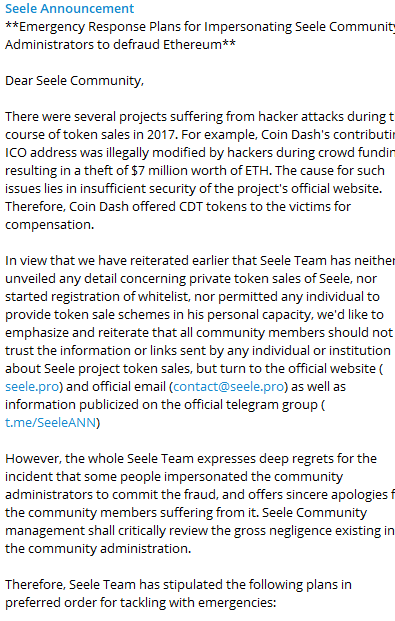 In response to the fraud, Seele’s members identified the scammers and removed them from the group, creating a scam warning for users in the group. They have also since added more security features, including double authentication (i.e. face recognition and scheduled login). The token sale has not yet been announced.